During the last 2 miles of my long run this past Saturday, I passed another milestone in my running surpassing 35,000 miles since I began running on June 7th 1977. I had actually attempted running the summer before but after a couple of weeks I stopped. When I made the decision to start again I was committed to continuing with it and recorded my 1st run on the chart pictured above. I chose to make the chart like a calender and have been using the same loose leaf charts now for almost 34 years and I am about to fill up page 178. At the time I began, things were a whole lot different than they are now. Although I was aware of the Boston Marathon and had been a fan of the Olympics, I did not know a single person that was a runner.I was aware that "jogging" was used by some as a way to exercise. 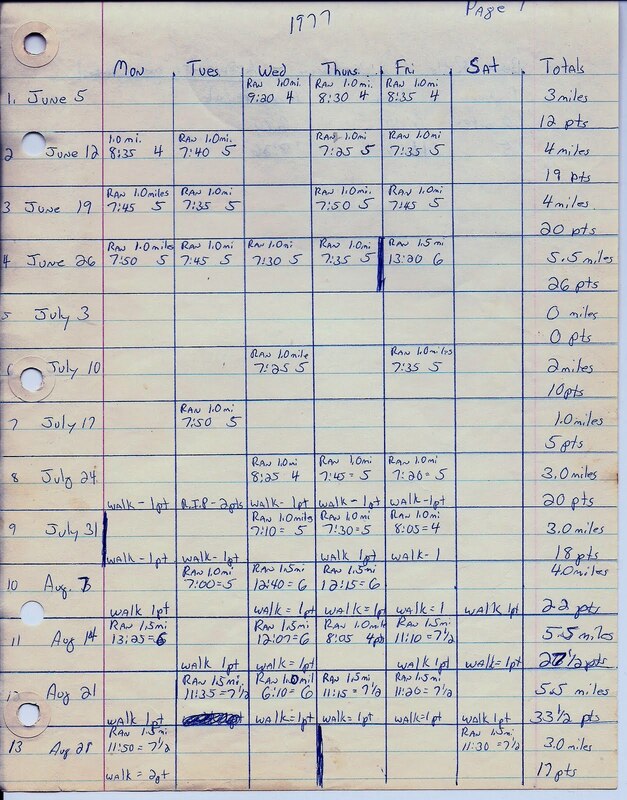 If you notice the points I was recording on the chart, that is from a system devised by Dr. Ken Cooper in his first book "Aerobics" There had been an article in Readers Digest magazine back when the book was written in 1968 and my family had bought the book after reading the article. I was 12 at the time and my brother was 16. Being competitive siblings we of course tried to score the most points counting our basketball , tennis, walking, biking and for a short while our running. Yes,we took a wooden yardstick and measured a 7 lap to the mile course around the perimeter of our 2 acre yard. That didn't last long before we moved on to other things. So fast forward again to 1977, I re-read the book and devised a plan to add an aerobic component to my fledgling body-building routine. The book really had no instruction on running that I recall, just a study of how aerobic exercise was good for the heart and with charts placed a value on different activities such as bicycling, swimming, tennis , basketball, walking and of course jogging. It would be about 4 months before I would find a Runner's World magazine. 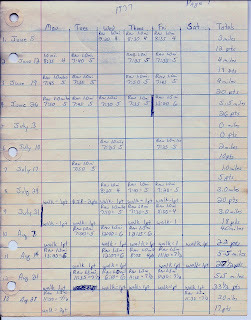 It was about 6 months later that I found Jim Fixx's Complete Book of Running and there was no internet so I was having to learn to run completely on my own. It would not be until March of 1978 that I heard of a "fun run" in North Carolina. Of course there had been other races and there was the beginning running boom, it's just that I had no way of knowing about it. In addition to the charts, I began a running journal a couple for days before that first race. It began as a loose leaf notebook, but in 1979. I started using 6x 9 notebooks. It would be over a year after I started running that I found out about the North Carolina Track Club. I did join but was intimidated by these "real runners" and despite running sub 8 minute pace in club fun runs I would usually end up in last place. Things are a whole lot better these days. I have so many friends in the NCRC, MTC and VHTRC. I have several regular running partners, mostly my beautiful angels and Princess. There are more races and fun runs every weekend than I could ever possibly run in. With the internet I have a whole online community of runners on Facebook, Daily Mile, and the ultralist among others and limitless resources to peruse at my convenience while relaxing on my couch. An interesting fact pertaining to the accumulation of those 35 thousand miles is that half of them have been run in just the past 9 years.It was in 2002 that I was bitten by a radioactive spider.No that was Spiderman. Umm, I was zapped with an overdose of gamma rays. No, that was the Hulk. Ok my home planet was destroyed and I escaped to earth and the Sun gave me super powers. No that's not right. Oh yeah ! Due to a small brain and a lack of rational thinking I ran my first ultra while averaging about 20 miles a week with maybe 3 runs of 13 miles and one 16 and one 17 miler in the year leading up to it. And so was born ULTRAMAN ! Looking forward to the next 35 thousand. Awesome Joey! Guess I started running 2 years before you . . . but you have far surpassed me! 35,000 miles is sooo cool! And I don't doubt you have another 35,000 in you just waiting to come out! I love this!! Awesome!! I try to keep a paper notebook of my training too. Who knows when the Garmin site will crash! Have fun in Boston, again! Love the story Joey! Looking forward to meeting you when we PR at Boston!